The bg based on real photo clipart I've got somewhere on the net. The concept? Just kinda pop-out from my skull and won't let go my hair 'till I finished it! psshh.. *kicks Korgie* he takes what I saw was wrong..
well you did a great job on retouching the scans, just the light source bugs me most..
Korgie said everything .. I like the colours though! great work! Nice! The colors are all cool but the sun there is kinda tiny. :P Other than that, great job. Well maybe the text could use some work, but it's not too bothersome, lol. anyhoo, that's a great extraction and concept ^.~ great work~! lol korgie ^^.I think you make the best of the retouching the scan , yeah I agree with the devilet ^^. The colour is nice too , I think ^^. You're making a good job cygnus ^^. waow waow waow!!! it's yuki and kyo!!! they're so funny together!^^ great job! it's very nice! wa!! a gorgeous wall! nice work! I relly love how you've tried to connect Kyo and Yuki, bringing a sense of togetherness. I really like how you've got both Kyo and Yuki in the wall and they work so well together. The colors work well together and though I see what everyone else is talking about with the light source - eh, there's an unseens spotlight infront of them, like in the movies. (My thought process.) Though I will agree about the text overlapping Kyo, that just bugs me when I see that. Good placement of the text though. One thing that I find strange is how Yuki's scarf is infront of Kyo's shoulder, but behind his head. That just seems weird and with his pose it almost look like he's ducking to not get whacked by it. Personal opinon would be to put Yuki's scarf totally behind Kyo. Really nice composition of the characters and the background. Nice work! It's very standard, but good enough for me to say, "Lovely!" Great job! :) two people who don't like each other. That looks great. I love the background. And All of the colors look great too. I Hope to see more wallpapers made by you. Its a cool image i like it. Thanks for sharing! 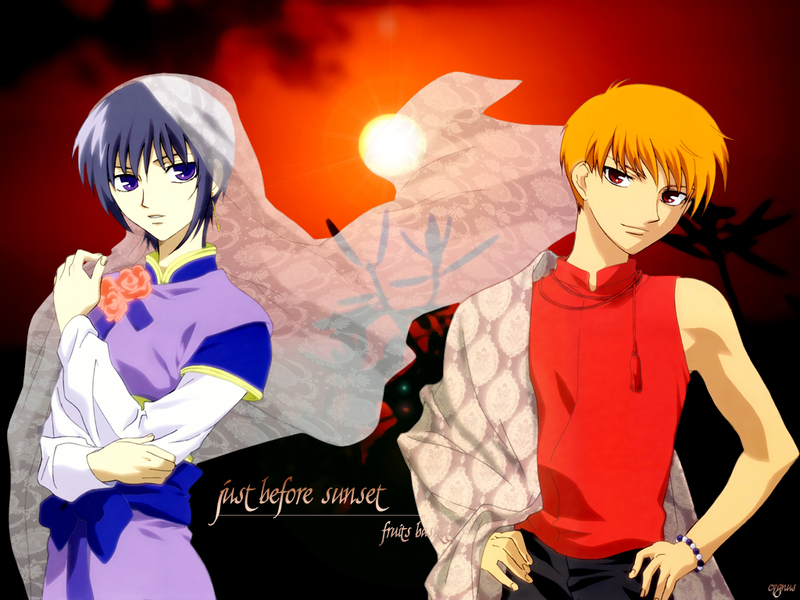 Yuki and Kyo match really well with the background. It's interesting to look at.